1. More outside water play! Chloe got in the bucket this time! 2. Chloe's 2nd cousin's came over to play Saturday evening! It is so, so sweet to see to see how much they love playing with her! 3. 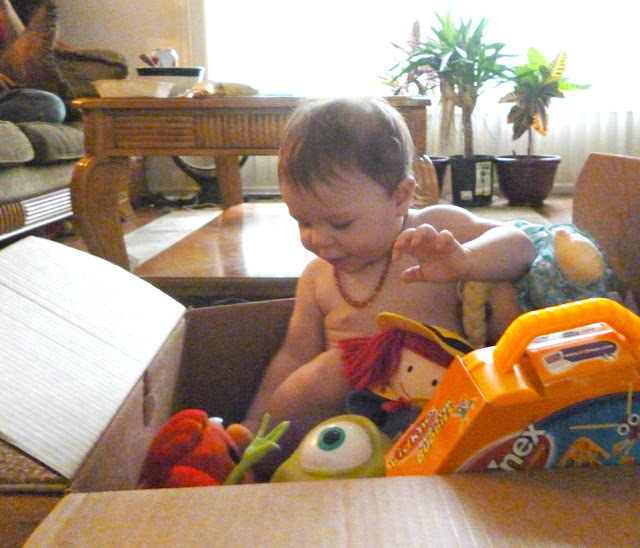 Chloe playing in a big ole box of hand me down toys she got from her Great Grandma! Hope everyone had a relaxing, wonderful weekend. I was just telling Erik that I couldn't believe they didn't have Coldplay during the closing ceremonies! LAME! I know they would have been so amazing!! oh no! we finally disagree on music haha! well i think i am in the minority when it comes to Coldplay so you win this one :) also so sweet sitting in her box of toys <3 that Madeleine doll is awesome :) ps. how is the job search? my fingers stay crossed for you!